Puzzly Ideas in Time for Valentine’s Day! Every year, we offer up some puzzly ideas for celebrating Valentine’s Day. Usually, we post it the same week of the holiday, but you know what? Even if they’re designed to be last-minute ideas, we thought we’d switch things up and offer a bit more lead time. Yes, Valentine’s Day looms large, and sometimes it’s hard to find that perfect way to express your love for that certain someone… particularly if that certain someone is the puzzly type. Jigsaw puzzles are the perfect metaphor for relationships, as they require separate pieces working together to complete the picture. There are necklaces and other pieces of jigsaw-themed jewelry, as well as do-it-yourself jigsaw patterns you can utilize. You could depict anything from a favorite photo to a specific Valentine’s message in the completed image. If they’re more into mechanical puzzles, our friends at Tavern Puzzles offer several brain teasers that incorporate a heart shape. But if you’re looking for something more personalized, why not make a crossword for them yourself? Now, to be fair, crosswords can be tough and time-intensive to make, so if that feels a little daunting, why not try a Framework puzzle instead? It involves the same crossing style, but doesn’t require you to use every letter. don’t want to use crossword-style numbering. It allows you to maintain a terrific word list all about you and your significant other without all the effort of filling in every square crossword-style. Have you considered a puzzle bouquet? 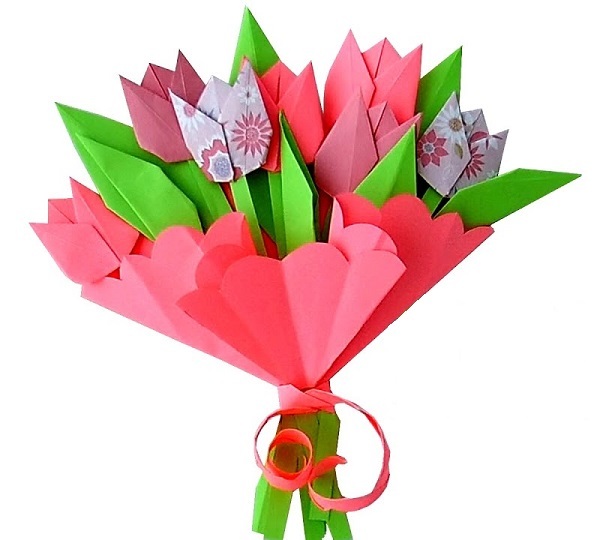 You could grab some newspaper crosswords and origami them into flower shapes for a fun puzzle-fueled spin on a holiday classic. Or you could hide jigsaw pieces around the house that, when put together, spell out a Valentine’s message or a picture of the two of you. Put your own spin on the idea. A little bit of effort can go a long way, plus it doesn’t cost anything. With a little more effort, you could whip up a scavenger hunt! You could leave clues around leading to a gift, or a romantic dinner, or some other grand finale. Maybe offer a rose with each clue. If you don’t want to leave things around where anyone could nab them, keep a few small tokens on you, giving one for each destination reached or clue solved. Heck, you could enlist a friend to text clues to your special someone once they’ve reached a particular destination! 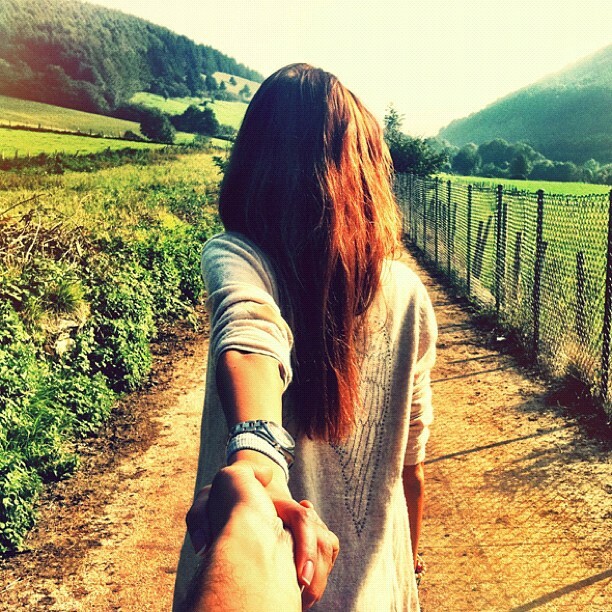 Or for something less formal, you could make a game of your romantic wanderings and play Valentine’s Day Bingo. The possibilities are endless when you put your mind to it. An Ancient Andean Jigsaw Puzzle? One of the best things about writing this blog is getting to talk about all of the amazing ways that people with puzzly skills have contributed to society. We’ve talked about codebreakers who saved Christmas and hunted Nazis, puzzlers who decoded ancient messages, and solvers who unraveled some of the mysteries of lost civilizations, all with the clever and insightful application of puzzle skills. I’m surprised we haven’t talked about archaeologists more frequently, because they’re basically detectives of history who try to reassemble the past jigsaw-style. 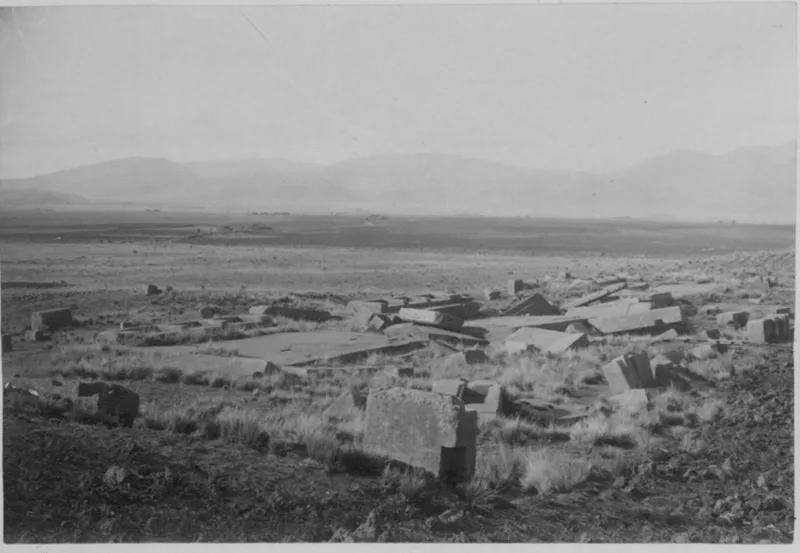 Recently, researchers from UC Berkeley put their puzzly skills to the test to solve a 1,500-year-old mystery: what the pre-Incan Tiwanaku temple known as Pumapunku actually looked like. You see, the temple has been raided, pillaged, and ransacked over the centuries, leaving archaeologists with very little information on what the temple actually looked like, or how the many giant blocks that originally composed the temple were assembled. 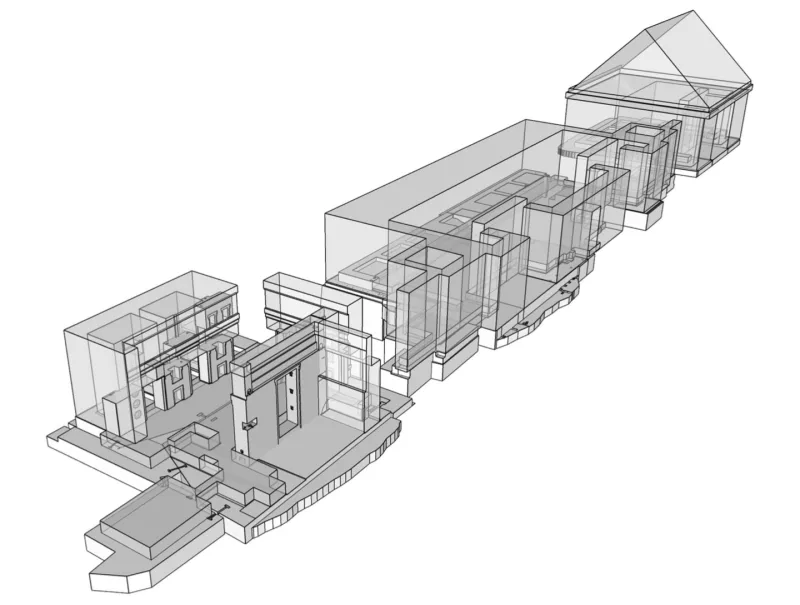 But, with a combination of computer modeling, 3-D printed pieces, and their own puzzly knowhow and dedication, they have cobbled together a rudimentary idea of what the Pumapunku temple looked like. 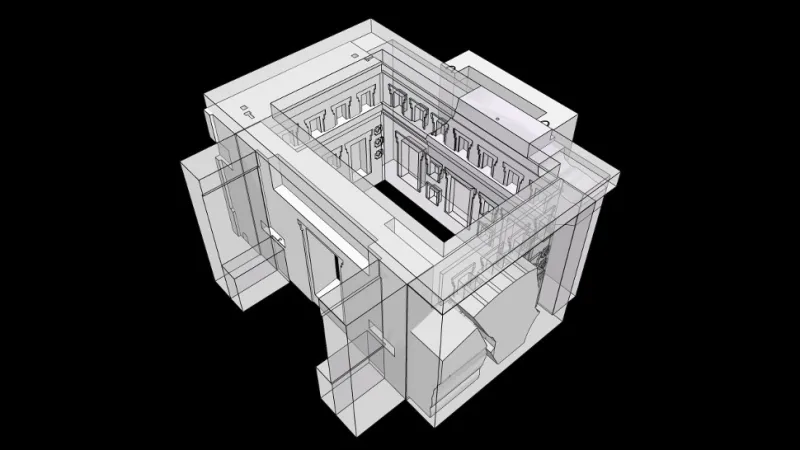 The team created miniature 3D-printed models, at 4 percent actual size, of the temple’s 140 known pieces, which were based on measurements compiled by archaeologists over the past 150 years and Vranich’s own on-site observations of the ruins. The researchers used comparative analyses and interpolation to reconstruct broken pieces… Yes, the researchers could have performed this work exclusively in the virtual realm, but they had better luck with tangible, physical pieces they could freely move around. Yes, not only were they using the pieces they knew about, but they were reassembling decayed or broken pieces as well in order to assemble the temple. 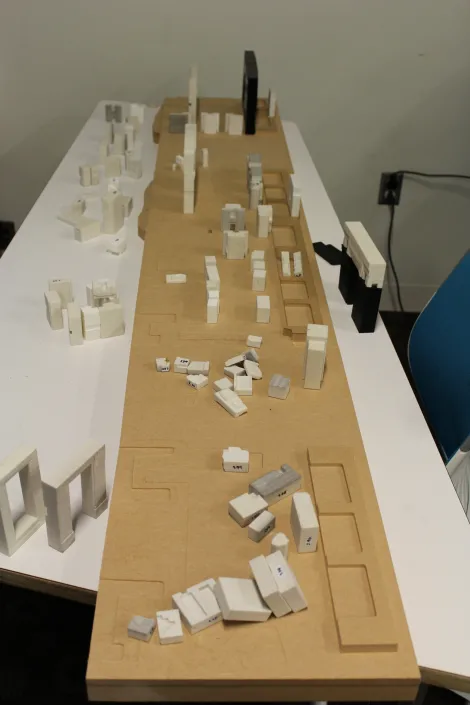 Vranich’s team gave a copy of the 3D-printed blocks to the Pumapunku ruins site director and taught the staff how to record the stones and model them. Vranich hopes that more blocks will be uncovered at the site, and further reconstructions of the temple complex will continue. With these techniques and the lessons learned by the Pumapunku build, the team is hoping to not only recreate this ancient Andean temple, but other destroyed historical sites as well, including those in the Middle East destroyed by ISIS. It’s an amazing investigative and deductive feat, made possible with puzzly skills. 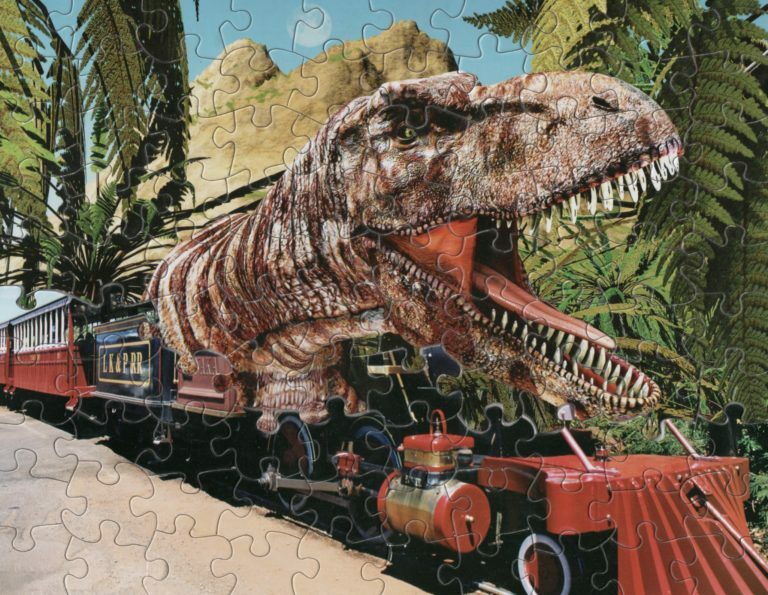 Jigsaw Puzzle Art Leads to Curious Creations! If there’s one thing that puzzle fans of all shapes and sizes excel at, it’s pattern recognition. Whether it’s patterns of letters, patterns of numbers, patterns of logical facts, or patterns of puzzle pieces, puzzlers are outstanding at drawing order from chaos. 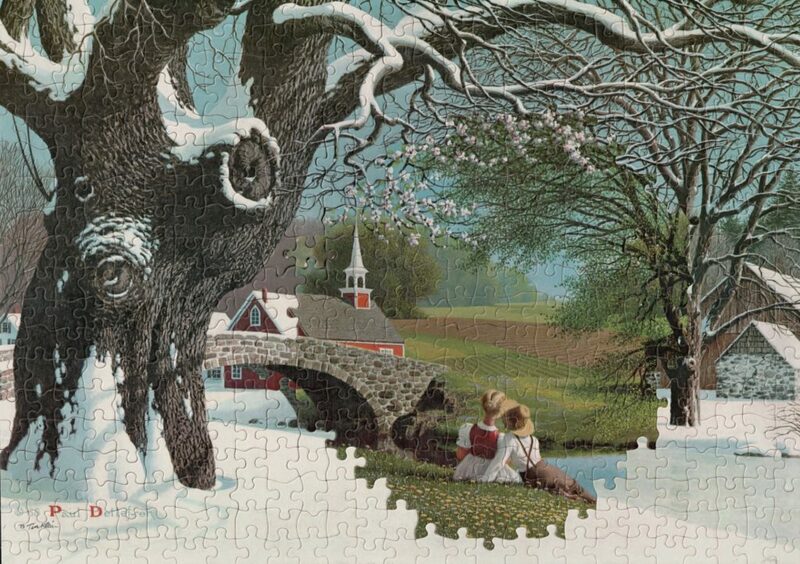 So it should come as no surprise that avid jigsaw puzzle solvers have noticed that some jigsaw puzzle companies use the same cutting molds over and over to create their jigsaw puzzles. Naturally, this has led certain attentive and intrepid puzzlers to track down different puzzles with the same cutting mold to see how the two puzzles interact. 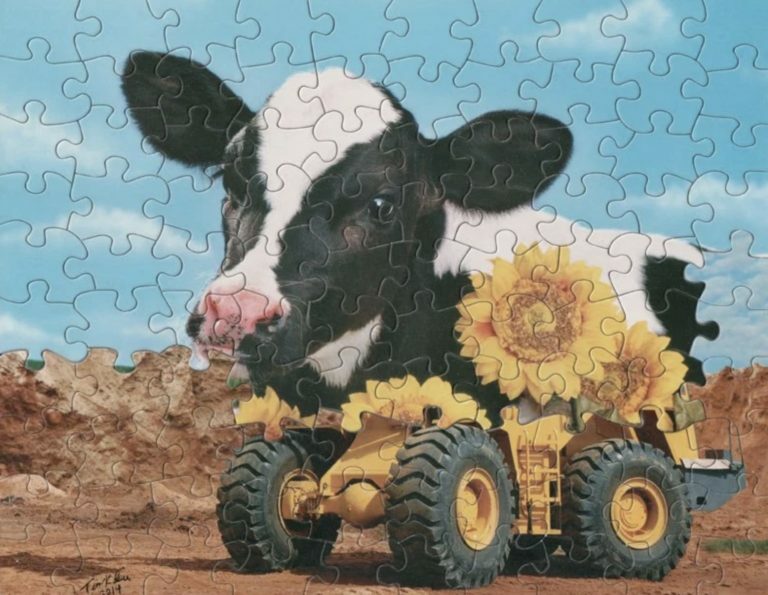 Jigsaw puzzle companies tend to use the same cut patterns for multiple puzzles. This makes the pieces interchangeable. 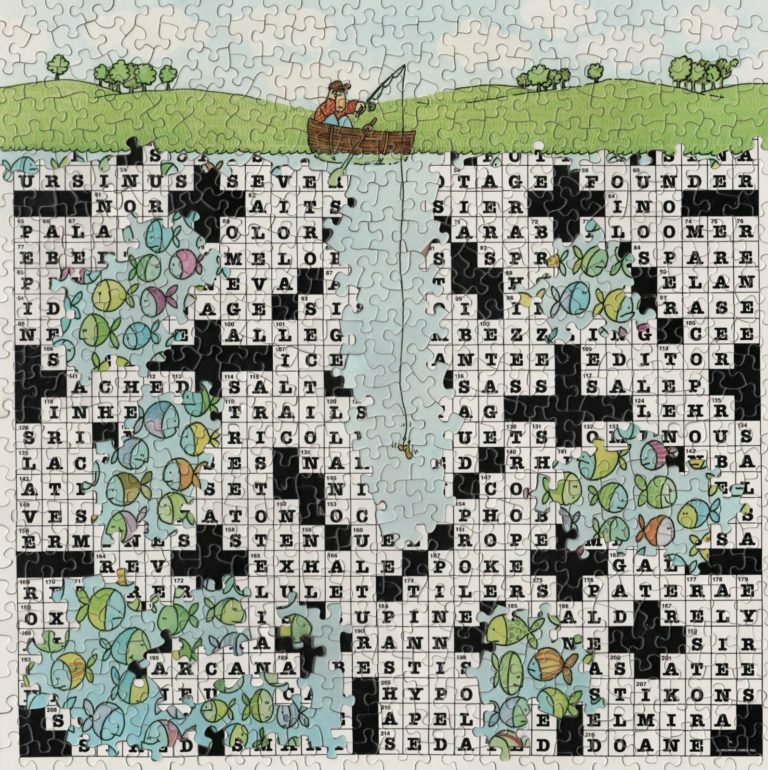 As a result, I sometimes find that I can combine portions from two or more puzzles to make a surreal picture that the publisher never imagined. I take great pleasure in “discovering” such bizarre images lying latent, sometimes for decades, within the pieces of ordinary mass-produced puzzles. As I shift the pieces back and forth, trying different combinations, I feel like an archaeologist unearthing a hidden artifact. And today, we’ve collected some of his puzzly creations for your enjoyment. This mixture of summer and winter is marvelously balanced, particularly with the summer and winter bridges matching up so perfectly. This fusion of a church and fairground adds a fun touch to an otherwise quiet and dignified image. I like to call this one the Earth Mooover. 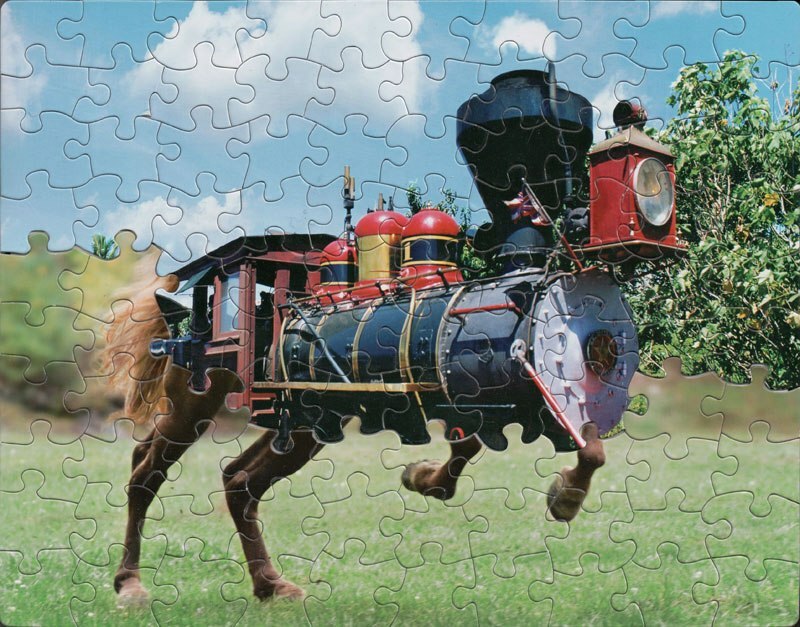 The Iron Horse comes to life in this surreal mashup. In a natural evolution, this dinosaur train is no doubt the apex predator of the animal-train hybrid food pyramid. This dinosaur/bunny monstrosity is a cuddly little ball of viciousness. No train parts needed. 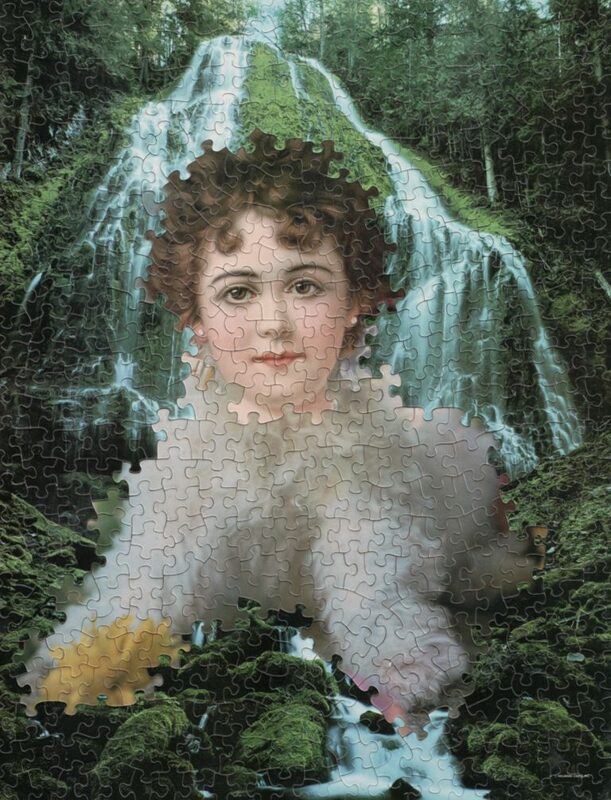 Mixing up elements of three different puzzles brings us this Victorian ladypuppy in front of a scenic waterfall. This is dream or nightmare fuel, depending on your perspective. 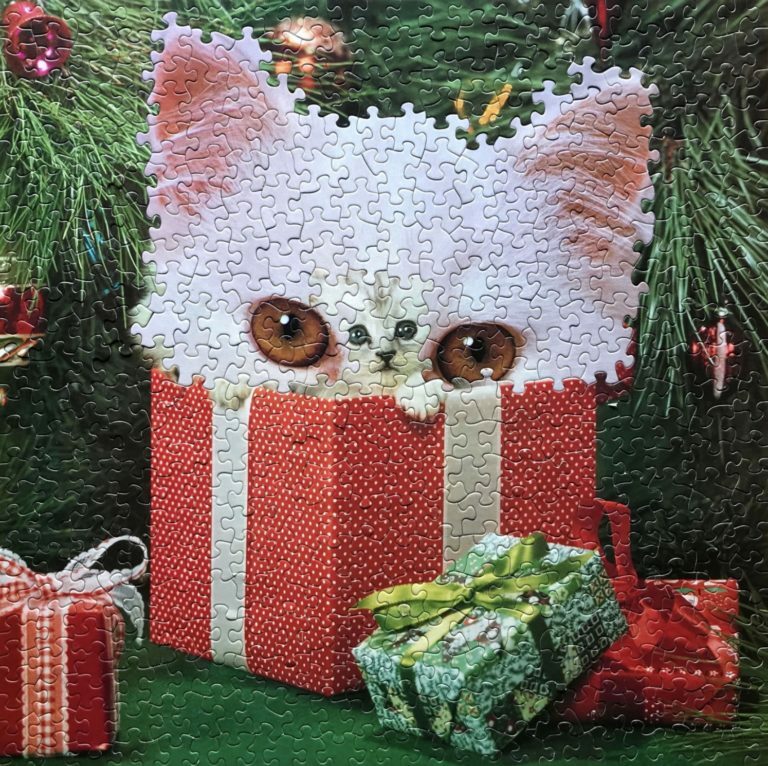 And to close out this compilation of Klein’s jigsaw art, it seemed only appropriate to end on a holiday-themed note, with this kitty-in-kitty-in-present melange. 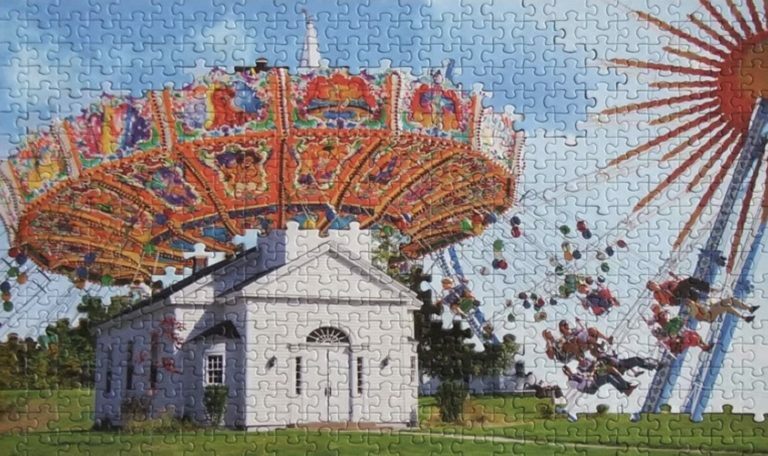 Klein’s jigsaw creations are as eye-catching as they are puzzling, and it makes you wonder what other hybrid constructions are awaiting the eagle eye of a devoted jigsaw puzzler. A few years ago, I wrote about the world’s largest jigsaw puzzle, a 5 feet by 19 feet, 33,000-piece monster called “Wildlife,” which took a young puzzle enthusiast 450 hours to complete. 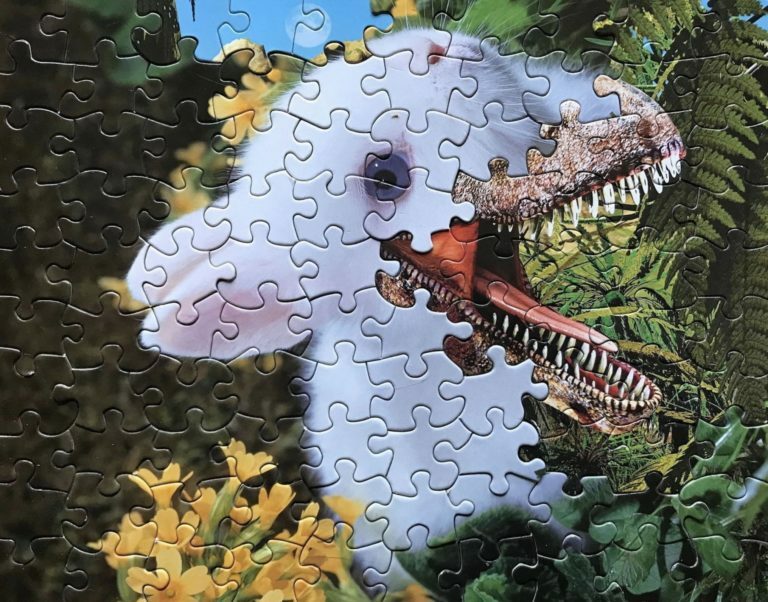 That was a cool story in and of itself, but as it turns out, some other puzzlers have gone one step further, using the Wildlife jigsaw puzzle as their canvas for a stop-motion animation video. This YouTuber, who goes by the name of Sky!, transformed the Wildlife puzzle into games of Tetris, Space Invaders, Pac-Man, and Mario Brothers, using completed sections of the puzzle as their gameplay elements. Apparently, it took Sky! and a cohort over 400 hours to solve the puzzle and another 400 hours to animate the video. That is some serious dedication. But that video got me thinking about other ways creative folks have used puzzly elements to tell stories. This is the story of a ball named Biisuke. Enjoy! It’s adorable and even has a song! How could you not love that? It just goes to show you there’s no end to the puzzly stories you can tell with a little creativity.